Luanda (formerly spelled Loanda) is the capital and largest city of Angola. Located on the coast with the Atlantic Ocean, Luanda is the country's primary seaport and government center. The central government, foreign embassies, international aid organizations, multinational oil companies and financial institutions are all based there. It was once the nation's industrial hub, but suffered years of neglect until it began to revive in the early twenty-first century. Inhabited from prehistoric times, Luanda came under Portuguese rule in 1575, and was the Atlantic slave trade center to Brazil until 1836. The port opened to foreign trade shipping in 1844, and by 1850, Luanda had become one of the most developed cities in the vast Portuguese Empire. In an 1872 report of the National Ultramarine Bank, the city was referred to as the "Paris of Africa." Following years of civil war and unrest from 1961 through 2002, beginning with the 13-year long Angolan War of Independence and ending with the death of Jonas Savimbi and the dissolution of the National Union for the Total Independence of Angola, the country's internal struggles ended in 2002. The Front for the Liberation of the Enclave of Cabinda, formed in 1974, ended its simmering revolt against the elected government of Angola with the signing of a memorandum of understanding in 2006. 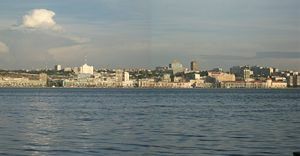 Luanda then underwent a period of extensive reconstruction, which altered the city's skyline and landscape significantly. While the city has a strong economy and a modern look, the outlying districts populated largely by civil war refugees are plagued by poverty. Luanda continues to build and to address its problems. Theories on the origin of the name Luanda include the notion that it derives from a native word luanda, meaning "tax," which reflects a practice in which shellfish caught there were sent as tribute to the king of Congo. Another view is that the area was known among the native African population as Loanda, the earlier name, meaning "flat land." The Kwanza River empties into the Atlantic Ocean just south of Luanda, and is home to 50 distinct fish species. The Capanda Dam, in Malanje Province, is a source of hydroelectric power for Angola, and provides water for irrigation of sugarcane and other crops in the lower Kwanza valley. Luanda's climate is hot and humid but surprisingly dry, owing to the cool Benguela Current, which prevents moisture from easily condensing into rain. The average high daytime temperature in January of 82.4°F (28°C), dropping to an average of 73.4°F (23°C) in July. Frequent fog prevents temperatures from falling at night even during the completely dry months from June to October. The short rainy season in March and April depends on a northerly counter-current bringing moisture to the city. Luanda has an annual rainfall of 12.7 inches (323mm), but the variability is among the highest in the world. The Bay of Luanda had recurring pollution by sewage spillage from the city. Dredging during the Bay of Luanda waterfront project during 2008 to reclaim land by extending the shoreline helped clean the polluted seabed. Luanda is divided into two parts, the Baixa de Luanda (lower Luanda, the old city) and the Cidade Alta (upper city or the new part). The Baixa de Luanda is situated next to the port, and has narrow streets and old colonial buildings. The slave trade left a lasting mark on Luanda as seen in the numerous forts, churches, chapels, market places, hotels, shops and quintalões, or slave "enclosures." Places of refuge or (quilombos) are also in evidence, either built or created by enslaved Africans. A more recent reminder of its turbulent past are the slums and infrastructure breakdown, a legacy of the 27-year-long Angolan civil war following the 13-year Angolan War of Independence. Remains found in Luanda, Congo, and the Namib Desert indicate that the area was inhabited in prehistoric times. The first to settle there were the Bushmen, who were primarily hunters, similar in stature to Pygmies and with light brown skin. At the beginning of the sixth century C.E., the Bantu migrated from the north, probably from somewhere near the present day Republic of Cameroon, and easily dominated the Bushmen and other groups considerably less advanced than themselves. The first large political entity in the area, known to history as the Kingdom of Kongo, appeared in the 13th century and stretched from Gabon in the north to the Kwanza River in the south, and from the Atlantic in the west to the River Kwango in the east of Angola. In 1482, Portuguese caravels commanded by Diogo Cão (born ca 1450) arrived in the Congo. Other expeditions followed. The Portuguese brought firearms and many other technological advances, as well as Christianity. In return, the King of the Congo could offer slaves, ivory, and minerals. Portuguese explorer Paulo Dias de Novais (1510–1589) founded Luanda in 1575 as "São Paulo de Loanda," with 100 families of settlers and 400 soldiers. In 1618, the Portuguese built the fortress called Fortaleza São Pedro da Barra, and in 1634 they built another fortress, the Fortaleza de São Miguel. Luanda was Portuguese Angola's administrative center from 1627, except for the period from 1640 to 1648, when the Dutch ruled Luanda as Fort Aardenburgh. The city served as the center of a large slave trade from ca. 1550 to 1836. It is estimated that three million slaves were shipped from Angola. The slave trade was conducted mostly with the Portuguese colony of Brazil. The slave trade was abolished in 1836, and in 1844 Angola's ports were opened to foreign shipping, bringing an economic boom. By 1850, Luanda was one of the most developed cities in the vast Portuguese Empire outside Mainland Portugal, full of trading companies, exporting (together with Benguela) palm and peanut oil, wax, copal, timber, ivory, cotton, coffee, and cocoa, among many other products. Maize, tobacco, dried meat and cassava flour also began to be produced locally. The Angolan bourgeoisie was born during this period. Luanda is one of several cities that has been called the "Paris of Africa"
In 1889 Governor Brito Capelo opened the gates of an aqueduct which supplied the city with water, a formerly scarce resource, laying the foundation for growth. The Portuguese Colonial War was fought between Portugal's military and the emerging nationalist movements in her African colonies between 1961 and 1974. By early 1974, the war had been reduced to sporadic independentist guerrilla operations against the Portuguese in non-urbanized countryside areas far away from the main centers. The Portuguese secured all cities, towns, and villages in Angola and Mozambique, protecting its white, black, and mixed race populations from armed threat. A sound environment of security and normality was the norm in almost all of Portuguese Africa. Economic growth and development in the region reached record highs during this period. In the early 1970s the city began to be referred to as the "Paris of Africa," a name it was affectionately called 100 years earlier, in the 1872 Report of the National Ultramarine Bank. However, the former colonies faced severe problems after independence, and civil wars developed in both Angola and Mozambique. The Portuguese Army's leftist military officers overthrew the Caetano government in Lisbon in the Carnation Revolution on April 25, 1974. The transitional government opened negotiations with Angola's three main independentist guerrilla groups: the Popular Movement for the Liberation of Angola, the National Front for the Liberation of Angola, and the National Union for the Total Independence of Angola, concluding separate peace agreements with each organization. With Portugal out of the picture, the nationalist movements turned on each other, fighting for control of Luanda and international recognition. This was the Angolan Civil War (1975-2002). At that time, Luanda was a modern city and most of its population was of Portuguese origin. With the outbreak of civil war, most of the Portuguese left as refugees, principally for Portugal, with many traveling overland to South Africa. There was an immediate crisis, because the local African population lacked the skills and knowledge needed to run the city and maintain its infrastructure. 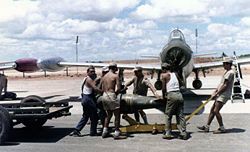 The large numbers of skilled technicians among the force of Cuban soldiers sent in to support the MPLA government in the Angolan Civil War helped restore basic services in the city. As refugees poured into the city, seen as a safe haven compared with war-torn parts of the country, slums called musseques developed, stretching for miles beyond Luanda's former city limits. Luanda's infrastructure could not handle this massive increase in the city's population. When the civil war ended in 2002, with the death of UNITA leader Jonas Savimbi (1934– 2002), revenues from increasing oil and diamond production enabled reconstruction. Angola has a multiparty presidential republic in which the president, who is both chief of state and head of government, is elected by universal ballot for a five-year term and is eligible for a second consecutive or discontinuous term. There is a prime minister. The president appoints a Council of Ministers. The unicameral National Assembly, or Assembleia Nacional, comprises 220 members elected by proportional vote to serve four-year terms. Angola is divided into 18 provinces (províncias) and 163 municipalities. Luanda is the capital city and one of three municipalities of Luanda Province. Governors of the 18 provinces are appointed by and serve at the pleasure of the president. The Constitutional Law of 1992 establishes the broad outlines of government structure and delineates the rights and duties of citizens. The legal system is based on Portuguese and customary law but is weak and fragmented, and courts operate in only 12 of more than 140 municipalities. Angola has a high growth rate, averaging more than 15 percent each year from 2004 to 2007, driven by its oil sector, which contributes about 85 percent of gross domestic product. A post-war reconstruction boom and resettlement of displaced persons has led to high rates of growth in construction and agriculture. Subsistence agriculture provides the main livelihood for most people, but half of the country's food must be imported. Angola's per capita GDP was estimated at $9100 in 2008. Luanda has a thriving building industry, an effect of a massive national reconstruction since 2002, the end of the civil war. The central government allocates funds to all regions, but the capital region receives the bulk of these funds, for roads and for social housing, to reduce the extensive slums in the city. Manufacturing includes processed foods, beverages, textiles, cement, and other building materials, plastic products, metalware, cigarettes, and shoes. Petroleum (found in nearby off-shore deposits) is refined in the city, although this facility was repeatedly damaged during the civil war. Luanda is the starting point of the Luanda railway that runs due east to Malanje, the capital city of Malanje Province, but did not reach Congo-Kinshasa in 2009. The civil war left the railway non-functional. A Chinese firm has taken up a contract to rebuild Angolan railways. Luanda's roads were in a poor state of repair, but in 2009 were being widened, sealed, and re-routed to relieve traffic congestion in the city. Many rely on privately owned combi-taxis for transport, although the city has invested more into a public bus system. The main airport of Luanda is Quatro de Fevereiro Airport, the largest in the country. An International Airport was under construction is the southern part of the city, which was expected to be opened in 2011. Luanda has an excellent natural harbor, which serves as the largest port of Angola. The port continues to expand rapidly. 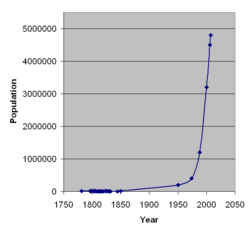 Luanda's population was 4,799,432 in 2007, and was listed as the 88th most-populous urban area in the world. The city's population has exploded, mostly as a result of war-time migration to the city, deemed safe compared to the rest of the country. This has brought an increase in violent crime, particularly in the shanty towns that surround the colonial urban core. The inhabitants of Luanda are primarily members of African ethnic groups, including the Ovimbundu, which make up 37 percent of Angola's population, the Kimbundu (25 percent), and Bakongo (13 percent) tribes. There is a small population of European (one percent) origin. There are also mestico (mixed European and native African) (2 percent), and other (22 percent). The official and the most widely used language is Portuguese, although many Bantu-related indigenous languages are also used. Forty-seven percent of Angola's population follow indigenous beliefs, Roman Catholics comprise 38 percent, and Protestants 15 percent in 1998. 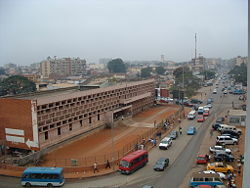 Luanda is the seat of a Roman Catholic archbishop. Luanda is the seat of a Roman Catholic archbishop. It is also the location of most of Angola's educational institutions, including the private Catholic University of Angola and the public University of Agostinho Neto. Luanda is the home of the colonial Governor's Palace, and the Estádio da Cidadela (the "Citadel Stadium"), Angola's main stadium, with a total seating capacity of 60,000. The city has beautiful beaches and a number of sights, including a Military Museum, the National Anthropological Museum, and Roque Santeiro, a huge open-air market. Funtogo market, located just outside the city, is Angola’s biggest arts and crafts market, and features musicians and dancers in traditional costumes every Sunday. The Slavery Museum is about 15 miles (25km) from the center of Luanda and contains objects and documents from the era of the slave trade. São Miguel fort, which overlooks Luanda Island was for many years a self-contained town protected by thick walls encrusted with cannons. Inside the fort, which is still used as a barracks, elaborate ceramic tiles tell the story of Angola from early years, and in the courtyard are large, imposing statues of Portugal's first king, the first European to sight Angola, Diogo Cão, renowned explorer Vasco de Gama, and other notables. 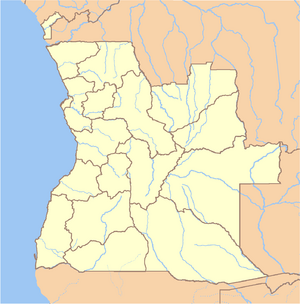 Angola is rich in natural resources - gold, diamonds, extensive forests, Atlantic fisheries, and large oil deposits. To take full advantage of these, the country will need to implement government reforms, increase transparency, and reduce corruption. It has rejected a formal International Monetary Fund-monitored program, although it continues Article IV consultations and ad hoc cooperation. Corruption, especially in the extractive sectors, and the negative effects of large inflows of foreign exchange, are major challenges facing Angola. As the capital and largest city (with over 30 percent of the country's population), Luanda's situation reflects that of the nation. Luanda's water supply has been the city's greatest problem since the beginning of its history. Public services in the city such as clean water, sewage treatment, and garbage collection are inadequate for the population, and outbreaks of cholera and other diseases resulting from lack of safe water have been frequent. The Department for International Development, formed in 1997, has partnered with the Luanda Urban Poverty Programme to promote access to basic services including clean water. Through the program, inhabitants of the city's slums have formed committees responsible for managing area water points. From these they dispense water to their neighbors at substantially reduced rates than those of private vendors. They are also in charge of keeping the water points clean and in good repair. These water points have had a major positive impact on the health of local people. LUPP's partners are Save the Children UK, Care International, Development Workshop (an Angolan Non-governmental organization) and One World Action. ↑ Statoids. Provinces of Angola Retrieved February 20, 2009. ↑ African Executive. History of Luanda Retrieved February 20, 2009. ↑ Anti-Slavery International. Slave Routes Retrieved February 21, 2009. ↑ Douglas L. Wheeler. 1998. Angola Journal of Southern African Studies. Retrieved February 24, 2009. ↑ 5.0 5.1 The Washington Post, International Spotlight: Angola, Charming Chaos Retrieved May 30, 2009. ↑ Webtourist. Luanda Retrieved May 30, 2009. ↑ China International Fund Limited. Railway Projects Retrieved February 24, 2009. ↑ China International Fund Limited. Airport Projects Retrieved February 24, 2009. ↑ World Health Organization. Angola Country Profile Retrieved February 24, 2009. ↑ Demographia. August 2008. World Urban Areas Population & Density Retrieved February 24, 2009. ↑ GlobalSecurity.org. March 13, 2006. ANGOLA: Easy access to guns concern as election nears Retrieved February 24, 2009. ↑ CIA World Factbook. Angola Retrieved May 30, 2009. ↑ World Port Source. Porto de Luanda Retrieved May 30, 2009. ↑ Department for International Development. February 13, 2009. Keeping the flow in Angola's slums Retrieved May 30, 2009. CIA World Factbook. Angola Retrieved February 20, 2009. Falling Rain Genomics, Inc. Luanda, Angola Retrieved February 22, 2009. All links retrieved August 1, 2018.